When I was first approached about checking out the WaterField Designs $335 Rough Rider messenger bag, it occurred to me that I've never written about something as decidedly non-technical before. Let's face it: When I plop down my case and begin unloading my work stuff, my focus has always been on the contents, not the vessel. But once the bag arrived, I realized this San Francisco outfit doesn't just peddle any old type of gear; its handmade leather goods (crafted in the US, to boot) are something truly special. Still, coming from a world of ultra-padded messengers, I was worried if it would be quite good enough to do the job. So I broke up with my cushy day-to-day bag and switched to this all-leather interloper to see how I'd fare. 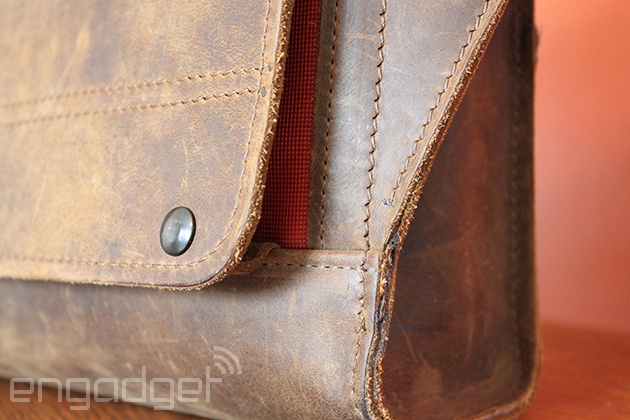 The bag's sides, back and front flap are made entirely from heavy-grade distressed leather. In fact, the monstrous Campbell Lockstitch sewing machine that zips the bags together is what first caught my eye. I'd heard that it was serious enough to pound through the bag's multilayer seams and even a hapless penny that dared get in the way. As it turns out, I received a sample of its stitching prowess that proved just that -- which now dangles proudly from my bag's shoulder strap. Speaking of, the strap is fashioned out of a woven, extendable seatbelt-like mesh with a soft leather floating pad to keep you comfy. Under the two-position, front button-down flap are two stretchy neoprene pockets and a couple more waxed canvas pockets on the inside of the bag. Finishing the outside is a thick leather handle that's riveted to the upper portion of the bag through a thick piece of stiffening material to prevent it from sagging when carried from the top. What's immediately apparent about the WaterField bags are the little design touches that make them both useful and all kinds of beautiful. For example, you can customize the fabric color of the front pockets during the ordering process, and with the bag closed, they're almost completely hidden except for a small sliver popping out below the front panel. The straps are anchored at an angle and are connected to the front of the satchel, so that while wearing it, it tends to hold the bag against your hip rather than dangling in space. 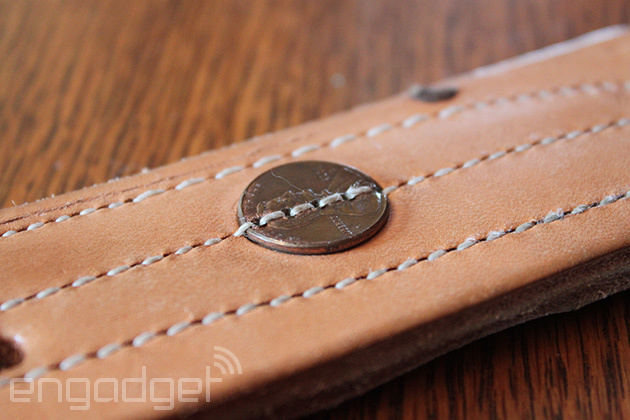 The leather's finish marks up really easily, but only serves to make the bag look even better as it wears in. It's also the only bag I've worn that's gotten me multiple compliments in a day. It's not an enormous catchall bag, though, but that's not to say it's tiny and can't hold most everything I need in the average day. 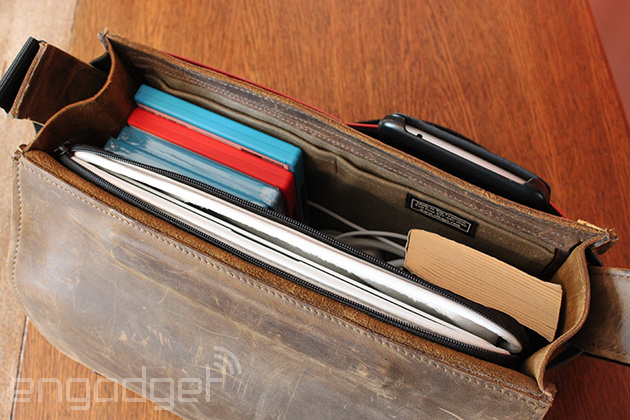 A tablet, laptop, charging gear, a paper notebook, snack and a paperback all fit snugly, but perfectly well. WaterField produces both 13-inch and 15-inch versions. I'm using the former, and while it can fit a 15-inch MacBook in a pinch, it's definitely a cramped fit. The 15-inch model, by the way, is slightly more expensive at $355. If I have any complaints (other than the price), it's that the bag could do with a softened pocket for laptops and some type of cinching mechanism to close up the inside. I carry my laptop in a sleeve to keep it from getting beaten up during my typical workday, and the bag accommodates that sleeve with ease. That said, having this built in would be a definite plus. Also, typical of any narrow messenger bag, it doesn't stand up on its own very well at all. I tend to lay it down when using it if there's nothing handy to lean it up against. A couple times, I've had coins trickle out the side and onto the floor when I wasn't particularly careful putting it down. A zipper or Velcro or something would be useful to keep your gear in the bag. The Rough Rider is functional, wonderful to look at and built to last forever. It's the nicest bag I've ever had; I can say that without any hesitation. It could pass as my grandfather's wartime satchel, but on the flip side, with its modern touches, it's perfectly suited to toting your equally high-end gear. Yes, it's expensive, but if you're in the market for a bag of this caliber -- one that could well last the rest of your natural life -- the price isn't too far out there.